The Jawaharlal Nehru University (JNU) organization has discharged a press articulation elucidating that there is no climb in the placement test charge, post claims of increment in test expenses by 300%. An outline was spilled via web-based networking media asserting that the expenses has been expanded to Rs 3,600 from Rs 1,200 for the general classification, Rs 2,700 for OBC and Rs 1,800 for SC, ST and others. 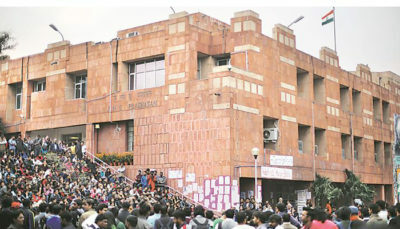 In any case, JNU has denied all charges and elucidated that the expenses for enrollment of Jawaharlal Nehru University Entrance Exam (JNUEE) continues as before as a year ago. The enlistments for admission to JNU has begun from today and the varsity will get applications till April 15, 2019. Be that as it may, the charges can be submitted till April 16, 2019. National Testing Agency (NTA) will lead the test this year, out of the blue, through the online multi-decision addresses strategy for admission to different undergrad and postgraduate courses. Stage 2: On the site, in the application segment, click the connection of ‘JNUEE and CEEB 2019’. Stage 3: Fill in the required subtleties and complete the enlistment procedure. Every year, the college leads a placement test called the Jawaharlal Nehru University Entrance Exam (JNUEE) for admissions to its different courses. Also, the college directs a different test called the ‘Jawaharlal Nehru University Combined Entrance Examination for Biotechnology’ (JNUCEEB) to offer affirmations in MSc Biotechnology, MSc (Agri) Biotechnology, MVSc and Mtech Biotechnology programs.